SHOUT – Ads Support HTML5 Radio Player jQuery Plugin has an option that alows you to show the current playing song & artist or to show ads. It will play ShoutCast and IceCast streams. 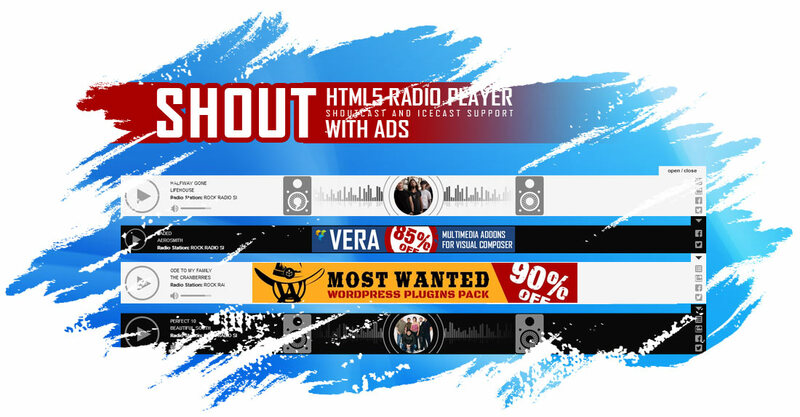 SHOUT – Ads Support HTML5 Radio Player jQuery Plugin can be used in websites which are responsive. It is a full width player and it will cover the parent div width. P.S. What about Hero – Shoutcast and Icecast Radio Player With History – The ultimate radio player with history support which will play ShoutCast and IceCast streams.